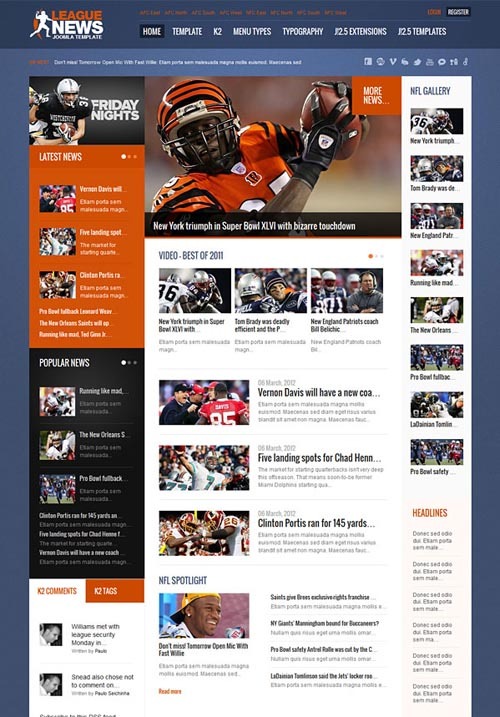 League News – Premium Joomla sports magazine template. Be out of the league; impress your competitors with irresistible look of your website! Count up your points and be placed first on the podium. Go in for it; present the spectacular views and amaze your visitors with information displayed. Present sport news and other with this unique Joomla template! The template is appropriate for Sports, as well as, News websites. All GavickPro templates are built on the Gavern – one of the best, intuitive and customizable framework for Joomla Templates. Add style and pizzazz with GavickPro built-in typography features: code listings, quotes, text blocks with icons, tooltips, and more. Be up-to-date; amaze your visitors by using templates with support for mobile devices like iPhone, Android mobiles and other! Let users log in using their Facebook account, and easily add social media buttons to your site (i.e., Facebook, Twitter, Google+, etc…). The GavickPro Joomla! Development Studio creates professional-grade, high-quality templates and extensions for Joomla.